The largest of all flat fish, Halibut weigh an average of 25 to 30 pounds but can also grow to 50 pounds or more. On the top, the Halibut is olive-green to blackish-grey and off-white on the underbelly. 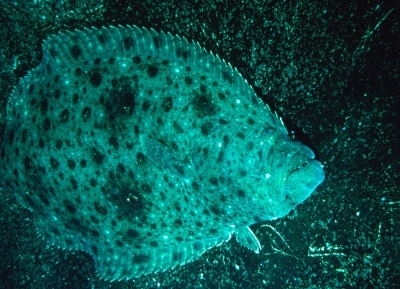 This coloring allows the Halibut to blend into its surroundings, with the dark side blending into the ocean floor and the light side blending into the overhead light of the sky. One feature of the Halibut is that both eyes are on one side but they are not born that way. Halibut spawn in the winter at depths of 600 to 1500 feet. The eggs hatch in approximately 15 days, producing larvae that are moved upward by currents. The tiny larvae have eyes on both sides of the head but at approximately six months, when the larvae is about an inch long, the left eye moves to the right side and the underbelly pigment fades to produce the same appearance as the mature fish. West coast Halibut are found along the continental shelf of the North Pacific, usually on or near the bottom over mud, sand, or gravel banks. Halibut have been recorded at a depth of 3,600 feet - but most are caught at depths of 90 to 900 feet. In the winter, Halibut tend to stay in deeper waters, so the best Halibut fishing is in the summer, when the fish rise to feed in shallower, coastal waters. Halibut are long-lived fish. Male halibut become sexually mature at eight years and females at 12. Halibut can live up to 40 years of age, which explains the massive size of some fish. The largest halibut on record was a 42-year-old female. A 40-year-old Halibut can be more than eight feet long and weigh over 500 pounds. These large halibut can eat octopus, herring, crabs, clams and smaller halibut. Most halibut caught in the sport fishery are 8-15 years old and weigh between 10 and 100 pounds, with the larger halibut tending to be females, which live longer and grow larger. On record is a sport fishing catch of a 459 pound halibut. Part of the popularity of Halibut is due to its flavor. Halibut has delicate sweet flavor, snow-white color and firm flaky meat and offers an excellent source of high-quality protein and minerals, low in sodium, fat and calories. It contains a minimum of bones. It can be prepared a variety of ways. Once you return home with your catch from your Chad's Coastwide Sport Fishing charter, you'll be able to choose between baking, broiling, pan-frying, deep-frying, poaching or barbecuing your halibut. To book your Port Hardy halibut fishing adventure, click here.